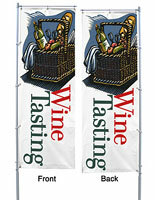 These Business Flag Banners are Similar to Large Outdoor Feather Signs! 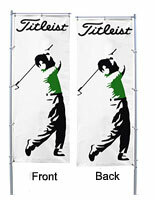 Custom Signage Combined with Flagpoles Offers Proprietors an Excellent Promotional Solution! 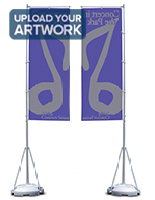 Purchase Flag Banners with or without the TriPole System Depending on Your Needs! 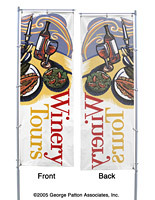 These three color, silkscreened flag banners allow for more elaborate designs and logos. With two spot colors and a white flag background, there are a limitless number of custom promotional possibilities. These flag banners are actually two signs sewn back to back, so any text reads correctly from both sides. Our company has connected with one of the world's foremost outdoor fabric banner and flag silkscreen printers based in Europe. The fade-resistant inks are applied to the white knitted polyester flag banners according to the three color designs customers submit. In addition, hemmed edges prevent fraying while white edge reinforcement on one side and along the top prevent the grommets from ripping out.